Dems: The Acting Attorney General Can't Continue In His Job. DOJ: Yes, He Can Critics are continuing to put pressure on Matthew Whitaker after he was named as temporary replacement for Jeff Sessions. The Justice Department says the law is clear: He can stay. 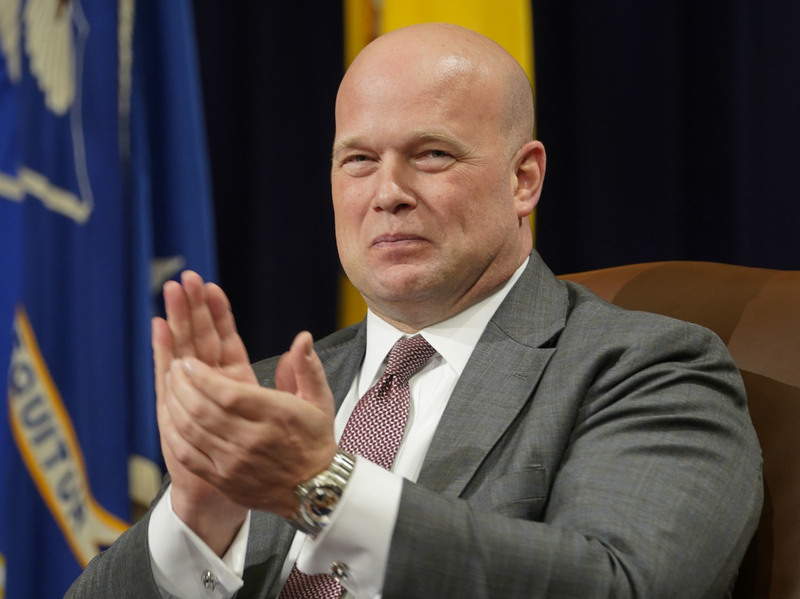 Critics are continuing to put pressure on Matthew Whitaker after he was named as temporary replacement for Jeff Sessions. Critics intensified their pressure on the acting attorney general on Tuesday, but the Justice Department — including the office of special counsel Robert Mueller — says it's carrying out business as usual. Senate Minority Leader Chuck Schumer asked the Justice Department's watchdog to investigate whether there have been any "unlawful or improper communications" between the White House and acting Attorney General Matthew Whitaker. Democrats say they worry Trump is using Whitaker to lean on Mueller, who is investigating whether anyone on Trump's campaign may have conspired with the Russians who attacked the 2016 election. Whitaker publicly criticized the Mueller investigation before joining the Trump administration. "Recent reports regarding Mr. Whitaker's unusual history of contacts with the White House give rise to serious concerns about whether he has engaged in communications intended to undermine or obstruct special counsel Robert Mueller's investigation into Russian interference in the 2016 election, or that otherwise may have been in violation of law or policy," Schumer wrote. He was the latest Democrat to go on the offensive against Whitaker over what critics call his "unconstitutional" appointment. Trump put him in place over the Justice Department's already-serving and Senate-confirmed Deputy Attorney General Rod Rosenstein. A group of Democrats earlier sued the Justice Department in federal court over that appointment, arguing that Whitaker's installation amounts to a bid by Trump to constrain Mueller's work. "The idea that Matthew Whitaker will control this investigation is absolutely abhorrent. He should at the very least recuse himself," Connecticut Sen. Richard Blumenthal told NPR. "He's already stated that he thinks that the investigation is in effect a hoax. He has provided a blueprint for how to stifle and strangle it by cutting funds, cutting authority, declining subpoenas." The Justice Department says Whitaker's appointment is supported both by law and history. "President Trump's designation of Matt Whitaker as acting attorney general of the United States is lawful and comports with the Federal Vacancies Reform Act, the appointments clause of the U.S. Constitution, Supreme Court precedent, past Department of Justice opinions, and actions of U.S. presidents, both Republican and Democrat," said spokeswoman Kerri Kupec. She alluded to a opinion released by the Office of Legal Counsel that found many past examples of what it called appropriate interim appointments. Continued Kupec: "There are over 160 instances in American history in which non-Senate confirmed persons performed, on a temporary basis, the duties of a Senate-confirmed position. To suggest otherwise is to ignore centuries of practice and precedent." Separately, Mueller's office also argued in legal documents that, for at least the purposes of one ongoing court case, Whitaker's appointment has no effect. The special counsel's office has been fighting a challenge to its legal authority by Andrew Miller, an associate of political consultant Roger Stone. Miller's attorneys have argued in federal court in Washington, D.C., that Mueller does not have the power to compel Miller to give evidence under a subpoena. As part of that case, a judge asked the parties to explain how much effect Whitaker's appointment has on Mueller's work and the ongoing case. Zero, the special counsel's office argued. "None of [the] arguments is affected by the change in the identify of the acting attorney general while this case is on appeal," Mueller's office said in a court filing Monday. "This court should resolve any new challenges that Miller might raise."